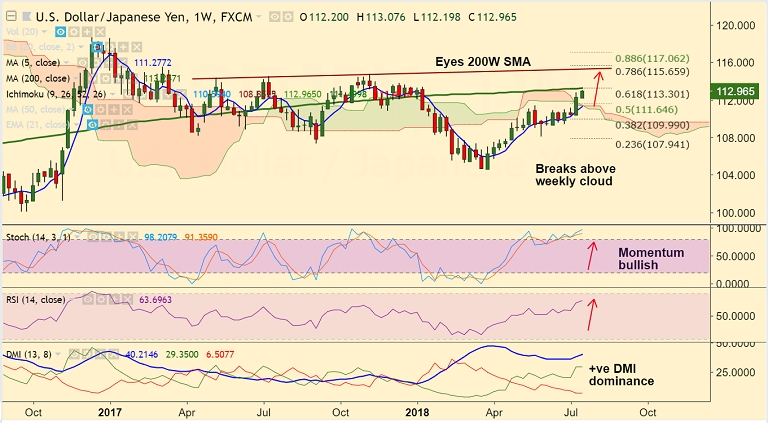 USD/JPY has hit fresh 6-month highs at 113.13 before paring some of the gains to currently trade at 112.96 levels. The greenback was buoyed across the board after Powell's optimistic testimony. Fed Chairman Jerome Powell reiterated that the Fed would continue to gradually raise the fed funds rate in compliance with their mandate to reach maximum employment and 2% inflation. Powell's comments, during the semiannual congressional testimony also suggested that lingering trade tensions will not prevent the Fed from raising interest rates. The pair has given up some of the gains as markets await US housing market data ahead of Powell's second round of testimony before the House Financial Services Committee. Technical indicators support upside. Momentum studies are bullish. Price finds immediate strong resistance at 200W SMA at 113.24. Break above targets 78.6% Fib at 115.65. FxWirePro Currency Strength Index: FxWirePro's Hourly USD Spot Index was at 83.9716 (Bullish), while Hourly JPY Spot Index was at 0.498775 (Neutral) at 1145 GMT. For more details on FxWirePro's Currency Strength Index, visit http://www.fxwirepro.com/currencyindex.